As the 1990s advanced so too did a broad interest in architecture. One of the great favourites among the public at large is this new residential district on the northern rim of Amersfoort. Ashok Bhalotra, who drew up the masterplan, focused on ‘the subjective imagination of the individual’, in doing so turning away as much from the formal modernist housing being built well into the 1960s as from the ‘building for the neighbourhood’ brigade of a decade later. Resorting to associative symbolism and a many-layered reading, Bhalotra seeks to stimulate (and orchestrate) the imaginative powers of those who live there. 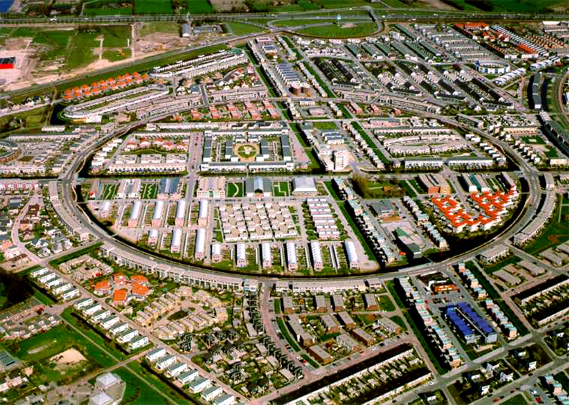 The district can be broken down into five formal elements: De Ring, a central neighbourhood circumscribed by a perfect circle of development scaled to Amersfoort’s historic centre; De Laan der Hoven, a major east-west axis with successive apartment buildings, a shopping centre and the access to the district as a whole; De Verborgen Zone, a ‘symbolic city’ predicated on adventure, discovery and secrecy; Het Masker, the district’s south-eastern border whose long groping line symbolizes the many-layered, the anonymous and the representative; and lastly De Kreek, which pulls together farms scattered locally and represents the irrational, romantic life-feeling. Joining these five key urban elements are a quintet of habitats (contained city, fort, room of farms, bridge-houses and ‘living on winter-gardens’), five landscapes (water, pool, wood, field and marsh) and five urban morphologies (avenue, canal, square, path and street). The architects entrusted with fleshing out the plan’s components have done their best to express the narratives and symbolism in their architecture, resulting in a heterogeneous assemblage of contemporary housing.